I was recently invited to speak at the Governor’s Economic and Education Summit at the Renaissance Center in Detroit. My speech seemed to cause quite a stir, and the response has been tremendous. I was quite surprised by this because I only said what I know all teachers feel. Several people reached out and asked me to publish it, so I have shared it below. I can only hope my message will reach the people that need to hear it most. I am a wife and a mother to three kids, my 8-year-old daughter and 5-year-old twin boys. I share this not only because I think my kids are adorable, but because my family comprises many different aspects of society: my husband as a business owner, myself as a teacher, the two of us as parents and my children as students and the future generation that can change the world. Each of us has a stake in the conversations we are having today, and we should each have a voice, as well. I have three key initiatives this year within different aspects of education. Academically, it is a privilege to share a system that I’ve developed to increase math fact fluency, as well as materials that I’ve created to teach metacognitive strategies for reading comprehension. Teachers are lacking quality tools to meet our students’ needs because the resources we are given are made by people that are far too removed from a classroom. The most effective resources are made directly by teachers because we know which strategies work best. We just need the chance to share. Socially, it is my mission to shift our thinking and change our approach to bully prevention. I recently published a children’s picture book that helps kids get past the bully stereotypes they see on TV and in movies, and instead allows them to see that we all act like bullies sometimes. This comes from a decade of experience with genuinely nice, bright third-graders who are often mean to each other but refuse to see it as bullying because they do not see themselves as bullies. 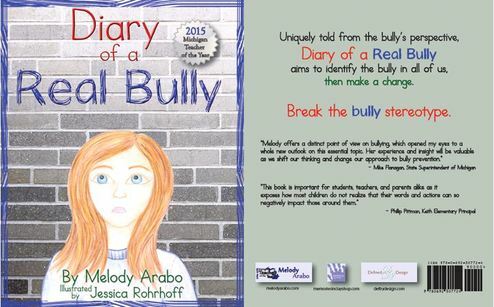 Uniquely told from the bully’s perspective, “Diary of a Real Bully” aims to identify the bully in all of us, then make a change. Kids need to understand that bullying is not about what you are; it is about how you make others feel. If we can teach children about real-life bullying early on, we will have fewer bullies. If we teach them the skills they need to communicate and solve problems early on, we will have fewer victims. We need common language, effective strategies and early intervention. I’m pleased to be part of this important discussion. Professionally, it is my goal to increase leadership opportunities so that teachers can expand their reach and make a greater impact without having to leave the classroom. Our system is in a state of change and transformation, and teachers should be at the forefront. While I get this magical year to explore, connect, share and learn, one question lingers in the back of my mind: Why can’t more teachers have these opportunities? Why can’t more teachers attend state board meetings, speak to policy makers, visit schools and classrooms, and provide their perspective in important conversations? After all, no one knows what is best for kids better than those that are with them every day. The #michED movement is a grassroots effort dedicated to giving teachers, students and parents across Michigan a bigger voice in the conversation about education in our state. #LoveTeaching is an initiative started by former Michigan Teacher of the Year Gary Abud, 2015 Minn. TOY Tom Rademacher and 2015 national TOY Sean McComb to focus on all of the positives around the teaching profession. I've spent much of this year simply listening to educators. So what do teachers want? While my focus has been mainly on amplifying teacher voice, I started thinking about student voice. How often do we stop and ask students for their input on what we should be doing in schools? But shouldn’t we? After all, we are all in this for them. So I began listening to students. What do students want? If we want kids to get excited about learning, we need to give them reasons to want to learn. We need to transform our classrooms into learning labs, offer maker spaces to let kids explore and create. We need to stop spoon-feeding them information, and instead pose challenges that will teach them to understand their thinking and persevere in their learning. In my preparation for today’s speech, I had to shift my thinking a bit for a business audience. I don’t often stop and ask employers for their input on what we should be doing in schools. But shouldn’t I? After all, I’m doing my job so that I can prepare students for you. So I decided to ask our work force. What do employers want? Notice that all of these traits are human qualities, not a measurement of skills. Not one employer described a person’s knowledge of American history or their ability to list the periodic table or even their comfort level with technology, which we all know is important. With the ability to just Google anything, kids have a world of information at their fingertips – literally. According to Tony Wagner, author of “Creating Innovators,” “The world doesn’t care what you know; it is about what you can do with what you know.” Education is no longer about regurgitating facts; it is about critical thinking and problem solving so we can develop a future generation of innovators. If these are our goals for kids, how do we measure them? How do we possibly test human qualities like innovation on a multiple choice test? We can’t. Do we need to? “Sometimes the most brilliant and intelligent minds do not shine in standardized tests because they do not have standardized minds.” Why would we want any mind to be standard? But something became so clear to me: Standardized tests stifle creativity. Imagine what kids could show us if we let them. Most often, the best answers are not the ones that are given to us, but the ones we create ourselves. We’ve become so focused on standards and tests, that some might forget we are in the business of people. While I did spend time that year teaching curriculum and helping them meet standards, I mainly focused on each of my students as individuals. I showed them how to work hard and take risks and how to be well-rounded, good people. Most importantly, I tapped into their potential and helped them see the best in themselves. Together, we created a community of trust, respect, purpose and commitment. We became family. We were so deeply connected that we all cried at the thought of leaving each other. They are juniors in college, ready and eager to take on the world. Our connection has continued throughout the years, as I was able to be a part of their prom pictures, attend their graduation parties and even invite them into my home as our family babysitters. If you ask these kids what they remember about third grade, I doubt they would say anything about our matter and energy unit or the partial products math algorithm. But they would say that they felt valued and important, which is just what our kids need. In February, I got to spend time with the Teachers of the Year from each state and territory. These are 53 of the finest educators in our country, not because of their content knowledge or their instructional strategies, but because of their passion and commitment to their students. There I met Kathy Nimmer. She is the Indiana State Teacher of the Year. She is a finalist for National Teacher of the Year. And she is blind. Her application told the story of a student who struggled in high school. He said that every war has a turning point, and his time with Ms. Nimmer was a turning point in a war with himself. She believed in him and gave him the support he needed to make it through high school. After graduation, he enlisted in the military, and he told his family that if he were to die in combat, he would like to donate his eyes to his teacher. It is stories like this that will inspire each of us to do more, to be better, to push our limits until we become limitless. We all walked away from our time together feeling re-energized and ready to take on new challenges. We all felt valued and important, which is just what teachers need. Our teachers need to get connected, not only with each other, but with people from all professions. We should come away from this experience with new connections, newfound appreciation for the work that others do, and new avenues for collaboration. Social media is a powerful tool to keep those connections going. Our students also need to get connected, not only with each other and with their teachers, but with people from all professions. We don’t need to wait until high school to give kids real life experiences. We shouldn’t wait until they graduate to help them find their passions. It’s time to think big. It’s time to move kids to the right side of this T-chart. It’s time to break through the four walls of our classroom and connect with the outside world. It’s time to cultivate leaders. I did not see myself as a leader when I first began teaching. I was focused on my own classroom and my own students. It wasn’t until my fourth year teaching that my principal approached me about representing our staff in a new district initiative. It was the chance to research and learn best practices and watch other teachers in action, which to this day is still the most powerful professional development I’ve experienced. It was an opportunity to share with my school's colleagues, which created an environment of trust and collaboration that we’ve sustained ever since. But it took someone else to tap into my leadership ability, which made me feel valued, and in turn motivated me to work harder and grow. it lights a fire within them that cannot be extinguished.